The little Arlington Blvd / N. Queen St. - N. Rhodes St. intersection in Rosslyn now has 4-way stop signs. The intersection used to be just a 2-way stop. So if you're traveling on Arlington Blvd., you now have a new stop. That's easy to miss if you're coming up the access road from heading east on Rt. 50 into Rosslyn. The 4-way stop makes turning onto the little Arlington Blvd. from N. Rhodes St. safer and easier. In addition, there's a new (temporary) traffic light at the intersection of little Arlington Blvd. and N. Meade St. A permanent traffic light will be installed as part of the forthcoming Meade St. Bridge improvements. The new traffic light makes the intersection safer. But watch out for one possibly deadly mistake. Here's the deadly mistake. 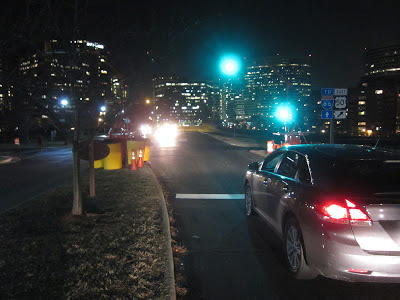 Supposed you are sitting at the red light on N. Meade St., facing downtown Rosslyn, waiting to take a left turn onto the little Arlington Blvd. You see a line of cars opposite you on the other side of the road. The light turns green. The line of cars opposite you doesn't go. You think, "oh, I have a protected green, and they have a red." You turn left, and get broadsided by a car going through the green light on another lane opposite further to the left. The stopped line of cars opposite to your left are cars in the left turn lane, not using their turn signals. Your side of the road is one lane, but the other side of the road has three lanes. The temporary traffic light structure makes those other two (non-turn) lanes less visible. Make sure that the opposite lanes further to the left are clear before you go through through the green and turn left.